Mayor Rahm Emanuel delivered one of the most anticipated speeches of his tenure Thursday evening at Malcolm X College on the city's Near West Side. During his roughly 45-minute long speech, the mayor outlined what he referred to as a "blueprint to confront gun violence," including hiring 500 more police officers and investing in technology such as gunshot-tracing cameras for use in the city's six most violent police districts. "As big a problem as gun violence is for Chicago, it is not beyond our ability to solve," he said. "Ending this string of tragedies is our top priority as a city. "We are infusing our Police Department with the manpower, technology and training to meet this challenge head-on." The mayor also announced a three-year, $36 million mentoring program for 7,200 at-risk kids in Chicago. He said he’s trying to fill a void in the lives of a lot of young people that’s being filled by gang leaders at this point. 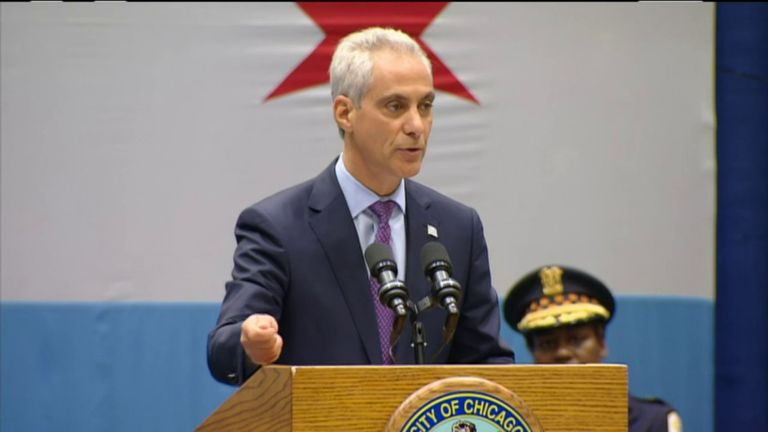 Emanuel's address comes as the city grapples with a 50-percent spike in homicides this year. He first announced his intentions in a Chicago Tonight interview last month. "It's a complex set of problems that will be addressed in a very comprehensive way," Emanuel said. "Everything from police, to children, to what we have to do for their safety to guns, to making sure we're providing hope where there is despair." Thursday morning, the mayor, along with the Chicago Police Department and Chicago Public Schools, released an internal study showing that safety is improving for public school children. According to statistics released by the mayor's office, there was a 33-percent drop in CPS students who were the victims of shootings between the 2011-2012 school year and 2015-2016, with no incidents reported on school grounds during that period. The statistics also show that there was a 33-percent reduction in criminal incidents along Safe Passage routes during school hours when safe passage workers are on duty. The mayor rolled out a portion of his plan Wednesday, with Police Superintendent Eddie Johnson announcing that the department would hire 970 new officers, field training officers, sergeants and lieutenants over the next two years. The expanded hiring would be in addition to filling any holes that result from retirements, bringing the overall police force to 13,535 from 12,565 sworn officers. A significant component of the mayor's address will also deal with the need for youth mentoring programs, akin to the Becoming a Man program that has often been highligted because of its success in counseling at-risk youth. The program has expanded to serve 2,700 students in 49 schools throughout the city. Statistics from the University of Chicago crime lab show that violent crime arrests were reduced by 45 percent among students who participated in the program, and that participants are 19 percent more likely to graduate from high school. Many City Council members will be in attendance Thursday, and say they welcome the mayor's renewed focus on the issue. But some say the root causes of violence cannot be cured by additional police officers or an expansion of mentoring programs. "I think we need to pause and think, 'What can we do to address the other ramifications that cause this crime?' And that means poverty," said Ald. James Cappleman (46th Ward). Sept. 21: The ranks of the Chicago Police Department are about to swell. Superintendent Eddie Johnson announced Wednesday the hiring of 1,000 new police officers, detectives and sergeants. Sept. 20: Community leaders from around Chicago join us for an hourlong conversation about the root causes of Chicago's violence, and what can be done to stop it. Sept. 6: After another violent holiday weekend, Superintendent Eddie Johnson issues a call for help to community members and African-American lawmakers. What is he asking for, and will it help reverse this year's spike in violence?